Although fishing as a pastime and as a sport is highly unpopular in India, But many enthusiast are now showing interest in the sport which has made Himachal emerge as the favorite destination for the same. This year the valleys of Himachal have been attracting tourist for a totally new reason which is different from its sky like hills. Himachal is now not only thronged by people to experience the might of the mountains but also by people who prefer to be in the foothills in the clean water of its river to try their hand at trout fishing. With clean and cold water, Himachal Rivers prove to be a haven for trout and are also believed to be one of the richest treasures for trout and its varieties. Beas, Satluj and Ravi flow through the hilly slopes of Himachal carrying fresh and cold water. Although the climatic conditions and the freezing cold water make it hard for the fishes to survive, The Brown Trout Fish survives with ease. They can be seen in Beas, Sutlej, Ravi, Tirthan, Sainj, Uhl, Baspa, Pabar, Lambadug, Giri, Rana, Nugal Gai, Baner, and Bata in Himachal. Sport Fishing and Recreational Fishing is also at times referred by a term called Angling. Himachal’s experience of Angling takes the term to a different level. 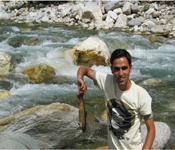 The streams in Himachal are divided into two, Namely the General-Water streams and Trout-Water streams. Trout and Mahseer are the major occupants of these streams; moreover Nemacheilus spp, Barilus sp, Schizothoracids Crossocheilus sp, Glyptothorax spp. Etc. 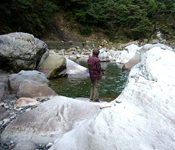 are some other species that can be found in these streams in Himachal. Angling can be done till the acme level at Himachal as the state boasts of various hubs for fishing both Trout and Mahseer along with other fishes. Brown and Rainbow trout which are considered as one of the finest sport fishes in the world can also be found in Himachal’s streams. State government has formulized a number of guidelines and rules that are must to indulge in angling in Himachal Pradesh. The streams of Himachal are divided as General Waters and Trout waters. The General water streams are approximately of a length of 600 km while the Trout ones are 2400 kms. 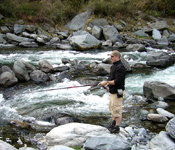 In trout water, the government issues licenses only for line and rod fishing . In general water streams though, One can obtain license for both rod and line as well as to cast a nest.